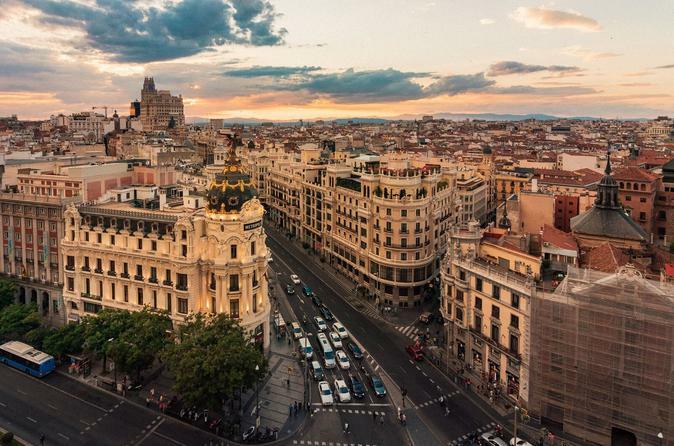 Immerse yourself in Madrid’s story and discover Spain’s capital with a local. Get to know the history, admire the must-see highlights and uncover its amazing hidden gems. Experience Madrid in a local way! Be amazed by the history of the city, admire the most popular sights and let the locals show you their favorite hidden gems. Meet your private guide at Plaza de Isabel and start your experience with the intriguing life story of Queen Isabel. Enjoy the breathtaking sights of The Royal Theatre and Plaza de Oriente while listening to unique local stories from your favorite host. Find out more about the history of the beautiful Royal Palace and admire its Italian Baroque style. From there, pass through a true hidden gem only known by a few locals, the Park Emir Mohamed I. Here you’ll discover the Moorish influences in Madrid’s architecture and the locals will give you all the insights you need. There’s more! Stroll through the heart of the medieval city - Plaza de la Villa - on your way to Plaza Mayor. A square dominated by Renaissance architecture, Plaza Mayor is Madrid’s main square. Before sipping a refreshing drink with your local host, get ready to take in a breathtaking view over the city from a rooftop terrace. Snap amazing pictures, take in the city’s vibe and enjoy the company of your friends or family. Just a moment later, you’ll pass the museum house of Lope de Vega - a famous Spanish writer, the majestic Neptune Fountain and the crown jewel of Madrid - Prado Museum with its famous masterpieces. Discover more interesting attractions along the way such as Glass Gallery Cibeles Palace and Alcala Gate, one of Madrid’s symbols. Finish your tour at Retiro Park, a beautiful green space loved by the locals. Admire the Crystal Palace located in the center of the park and ask your private guide for personal recommendations before you say goodbye. If you wish, your local guide can take you to the metro station or you can enjoy the rest of your day in the park. The place is full of nice terraces and it’s the best place to take a break after this walking tour. Our enthusiastic locals can’t wait to show Madrid in their own way. Get ready to enjoy a truly memorable tour!